The trouble with reviewing a Civilization game is that they're always good. From the 1991 original through to today, Civilization games have all shared the same core design ideas. 2K's marketing will try and sell you on new stuff all they want, but the nuts and bolts of this game are the same as they have always been, and the same as they will probably always be, and they're what really makes Civ great. You take turns, you build cities, you research tech, you fight. Those elements are the heart of the series' famous "one more turn" appeal, and it seems that over the decades whatever form they have been presented in, whatever tweaks and changes have been shuffled around at the periphery, the heart of the game has remained as strong and enjoyable as ever. The game's strategic view looks like a cartoon that Netflix should be making. It's been six years since the last full Civilization game was released. Six years! That's a record between appearances for the series. 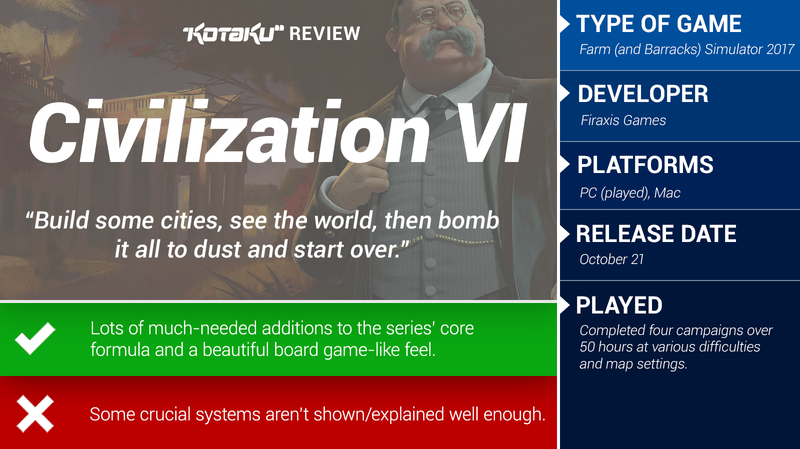 It's so long we had enough time to review Civilization 6 twice. That means the team at Firaxis have had six years to study the game that came before this one. Learn what made it ticked, see what worked, what was successful and what wasn't. Then take all that and build something new and improved on top of it. For the most part, they have succeeded though I wonder, now that Civ 6 is finally out, whether they might have been looking at it too long. There are now things called Districts, which basically mean that important city buildings are now built out onto the world map instead of huddling inside your settlement's walls. So your barracks, theatres and libraries now exist on individual hexes on the map itself, where they both gather bonus abilities with their placement (either by drawing on neighbouring Districts or resources) and lie vulnerable to enemy sabotage and attack. The tech tree has been broken up. You now have two of the things, one researching standard tech (pottery, battleships), mostly related to things you build, the other called Civics, which is for the research of ideas. Government and ideology have been completely overhauled. You now get a ton of things called policies over the course of the game, which are basically perk cards that you attach to your current form of government. Each policy gives you a particular bonus or ability, whether in combat, research, production, etc. Different forms of government allow for different numbers and variety (military, diplomatic, etc) of policies. Those are the main things you need to know. There are some other notable changes, some of which I'll get to below, others which don't really warrant a mention, but yeah, there's loads of new stuff here. This isn't just Civ 6 with fancier leader screens. Though the leader screens are now fancy. That's a trend that follows through to the rest of the game's visuals. There's a toy-like joy to Civ 6, from the colour palette to the cute little unit designs, and despite all the hours I've ploughed into the game so far, I cannot stop looking at all the adorable little touches and flourishes scattered throughout its world. Speaking of joy, the game's new happiness system knows how to make me, well, happy. I hated the way it was implemented in Civ 5, with its global factors and its restrictive influence on your empire's growth. Those are both gone now, replaced with a city-by-city system that weighs each settlement's size, facilities and needs and determines whether their citizens are happy or not. It's a lot more chilled, so anyone frustrated by their constant happiness handicaps in Civ 5 will be thrilled with this. Also cool are the game's new workers. They no longer build roads, sparing you from that tedium, as that important work is left to trade routes (and later, Military Engineers, a new unit). Instead, you use them to construct improvements like farms, only now there's a catch: each Builder can only be used a small number of times before they're gone. So plan and use them wisely. Civilization 5 was a good game at launch which then became something special through its two big expansions. That's a big legacy to live up to and a solid foundation to build off, but at times in Civ 6 it feels like Firaxis worked too hard at improving Civilization V, and lost sight of some of the finer points of the game's hidden fundamentals. There are systems in Civ 6 that seem fantastic (and which are integral parts of the overall experience), like trade and religion, but which go woefully under-explained by both prompts and tutorials, and thus go under-utilised until you bury yourself in FAQs and tips, which is very unlike Civ. There are menu screens — like diplomatic actions — which are important to the game and which you have to get through a lot over the course of 50-5000 hours, but which take 2-3 too many clicks to skip and dismiss. There are important milestones that you reach as a player, like moving into a whole new technological era, which are just kinda glossed over by the game, briefly flashing up a message before moving on. If you'd got up to get a cup of tea, you'd have missed it, then struggled to find the information somewhere else. 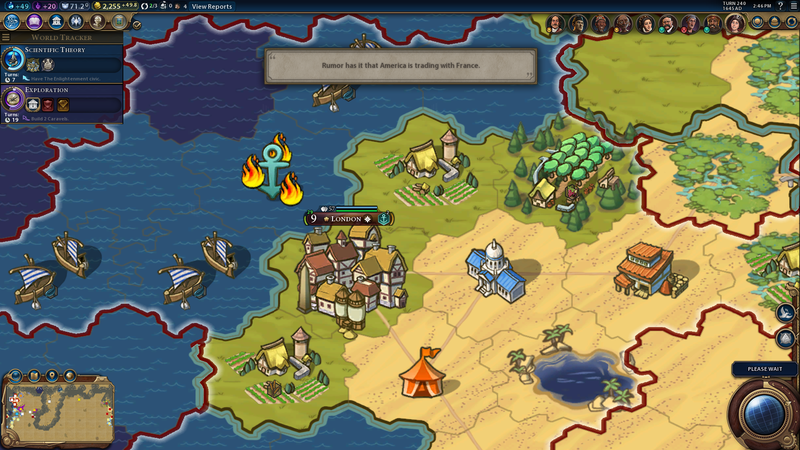 These might seem like minor little problems, but they speak to a larger concern I have with the game, and it's that for all its focus on its visuals and new systems, some of Civ's trademark polish has been left out. An attention to detail that makes every aspect of the game feel important and worthwhile, which permeated every corner of Civ 5 and helped make it a classic, and which isn't quite there in Civ 6. I also found diplomacy itself to be a step backwards, with leaders contacting me less often and with both more simplistic and more manic reactions to my decisions (not helped by the fact it's now harder to keep tabs on which political ideology each Civ is adhering to). Example: Trajan's repeated insistence (across games!) that I'm losing money, to the point where he once declared war on me, even though my bank balance was never in the red. Or China's Qin Shi Huang spending thousands of years being upset that he had less wonders than me, regardless of countless other political and ideological factors. I guess what I'm getting at with all this is that, having been spoiled by Civ 5's polish and near-perfection for years, it's a timely reminder that this game too will need some work, and these are the areas — along with bizarre AI behaviour like stockpiling early-era units — it will need it the most. Like I said up top, though, the foundations here are good, and none of those annoyances I just mentioned can derail what it still a terrific strategy experience. Most of the game's new ideas are all geared towards the same objective: Civ 6 wants you to be able to run your Civ however you like, whenever you like. Policies and governments can be swapped out depending on which perks will benefit what you want to do, and the District system allows for a form of superficial urban planning that increases the degree to which individual cities can specialise. Conversely, this also allows you to adapt your style of play to suit whatever the game throws at you in terms of map generation. This is Civ 6's new fog of war system, rendering everything outside your realm as an old map. It is beautiful. It's a much greater degree of freedom than you've had in previous games, and it takes a while to get used to, but once you get your civics and policies and districts down, you'll see that you're free here to really twist the whole game to suit the way you want to approach it. And it's a lot of fun, as it easily lets you experiment with playstyles and approaches to scenarios that you might not otherwise have dabbled in. Civ 6's new stuff is also trying to solve what has long been the series' biggest problem: there's not much to actually do. With automated exploring and building you can go years in previous Civilization games without ordering or moving anything, and as involving as the overall experience is, that's always been a lull. Now your Builders need your constant attention. Your policies have been designed to be constantly tinkered with and swapped out. Barbarians seem more active, requiring more hands-on efforts to contain them. Your Districts don't just need to be built, they need to be planned. None of these new responsibilities entirely solves the problem, but they at least make a dent in it, and I found my time with Civ 6 to be far more interactive than any previous game. Which fits with an underlying itch you feel throughout the whole game: that it's a bit more board gamey than usual. This makes sense! 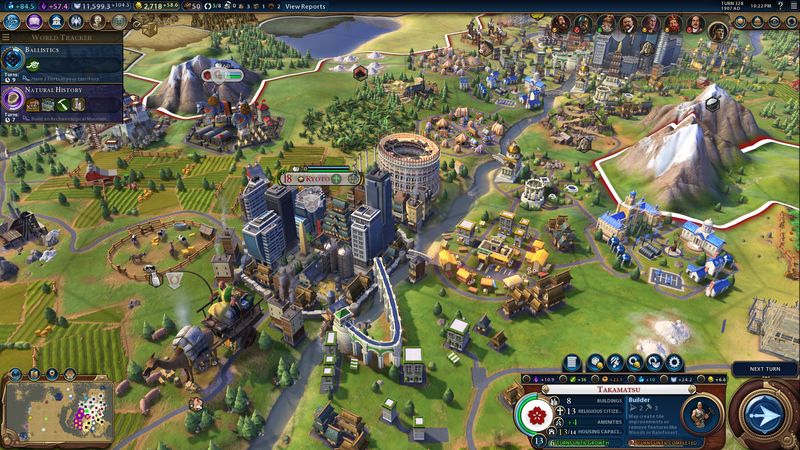 Before working on Civ 5's expansions, lead designer Ed Beach was a board game designer, and there are times where you feel this seeping through into Civilization 6. It wants you to be more direct with it, more literal, taking things that used to live in menus and putting them on the map itself, making you move things around that used to be automated. This makes Civ 6 feel more tangible, like you're more grounded in the land you're lording over. As someone who is very into board games, I love it. Civilization 6 has issues in unexpected places, but only a catastrophe was going to stop this being a real good time. And this is no catastrophe. What we've got here is a strategy game that, while preserving most of the series' longtime fundamentals, has also found new and surprising ways — through an investment in player choice and more hands-on time with your people — to keep things interesting. Because every Civ 6 game you start now is different. Your map will be different, your policies will be different, the way you need to build your districts will be different. I played Civ 5 for way too long, and that was a game in which I spent years entrenched in my established strategies, doing the same things over and over, and even then I was still having fun with it. Civ 5, which is already building upon what made Civ 5 so great anyway, forces you to adapt and play differently each time depending on your map and policies, so ... yeah, we could be in for a long, fun ride with this one. This article was unnecessarily difficult to read because you kept referring to Civ V as Civ 6 and vice versa. civ is not "always good". you could have spoken about how bugged civ v multiplayer was, how civ be multiplayer was even worse despite firaxis' claims to the contrary. how is civ vi multiplayer? Aside from the utterly broken diplomacy system and generally braindead, frustrating AI, my biggest issue is they doubled down on City States. I absolutely hated that addition in 5 and now it's even more integrated to the point that you basically have to engage with it. 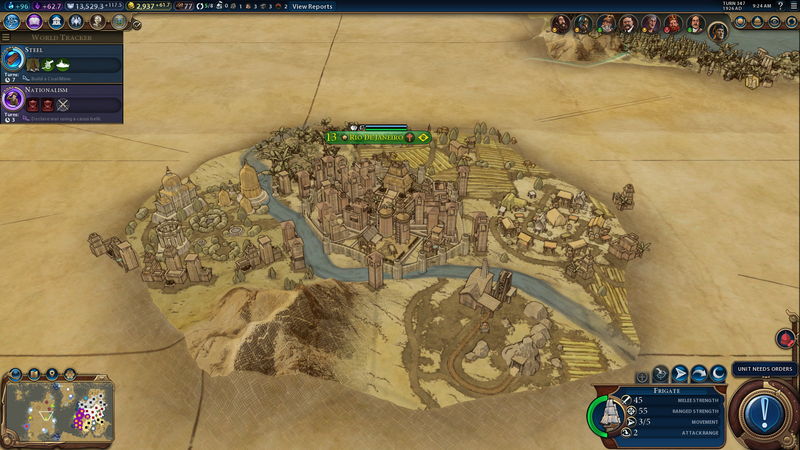 Also not a fan of the fact that a city's defenses appear based off the era their civ is in over any other factor. Had an issue where one civ that was still pretty much in the middle ages when I was in the Atomic age managed to steal an advanced tech off me. Suddenly they're thrust into the same age as me and I go from rolling through his cities with modern tanks the turn before to having to basically siege everything spending 2-3 turns bombarding their defenses down before I could actually take each city. The general UI is also horrid, as well as being buggy in a lot of cases. Overall I came away from the game I finished feeling like Civ 6 will be a really good game in a couple years once there's expansions to add in or fix the bits that are missing or poorly made and they've put the missing polish in. In the mean time, I'd rather stick to Civ 5 to scratch that itch. What is it about City States that you dislike? I really enjoyed their addition, It added a few more random elements to what could be quite a static game. Why not just set city states to zero in the advanced options? Because the City States are there to act as a crutch to keep the braindead AI in check. With them off, the actual civs will go on rapid expansion, building cities in stupid places because the areas are more open. what? cities now will not expand pass 3 squares - your territory will still grow after like hitting 18+ or something population. you just have to have cities everywhere or it doesnt work. and you will not be able to grab all the resources on map unless you want to have cities squashed together even worse. They actually do continue to expand territory beyond that. I got to 28 on my captial in one game. You stop being able to buy up hexes. Hmmm. Hard review to parse. Civ 5 broke me away from the franchise BECAUSE I felt it was so flawed and annoying; the happiness system was the worst and the game generally felt like it was trying to railroad specific styles of play by attaching such massive penalties on expansion and conquering. The diplomacy system was appalling. I couldn't think of many if any ways it improved on previous Civs. And it was buggy and crashed a fair bit. I'm aware some of these issues may have been fixed by expansions, but of course I didn't stick around to buy expansions hoping to fix a game I'd already given up on. So I guess I really need a review comparing this to the game I played (vanilla Civ 5) and not to Civ 5 plus expansions and years of fixes. Is Civ 6 good? I can't say I really like this idea of having cities spread out over multiple hexes... having the city draw upon surrounding tiles and improvements has always been good as a way of representing all the farms and villages in your nation without having to build them all individually, but really, we need a barracks taking up an entire hex and a temple taking up an entire other hex? What? A barracks or a temple don't take up an entire hex. You build an encampment district (which has it's own health and bombard like the city centre), and it then houses a barracks or stable, armoury, and other buildings. So all of your military buildings are in the one hex. You build a Holy Site district to house all your temples/religious buildings. The benefit from this is it allows the enemy (and yourself) to pillage specific parts of an opponents empire. If the enemy is close to culture victory, you don't need to necessarily take/raze their cities, just pillage the Theatre Square districts. Civilization 6 is much more lenient on expansion and conquering, with happiness now calculated on a city level instead of empire wide. There is also less emphasis on population for science / culture / gold etc, and instead more emphasis on the districts you have. The negative science / culture multipliers based on amount of cities / population have been reduced in Civ 6, allowing a large empire to be just as good as a small, focused one. Science, for example, is calculated at something like 0.6 beakers per population, instead of the 1-2 in Civ 5. But, a Campus (science) district can give you up to 12 beakers based upon adjacent mountains, and additional beakers if you build a library / university etc in the campus. Science buildings now give flat science per turn bonuses instead of percentage increases. buildings other than wonders are now built under districts depending on their type. then to upgrade and add a more advanced building it then stacks on the same districts. the number of districts you can built in a city is dependent on the population. there are more freedom in government system and alot of restrictions in where to place buildings. This article hasn't been proofread. 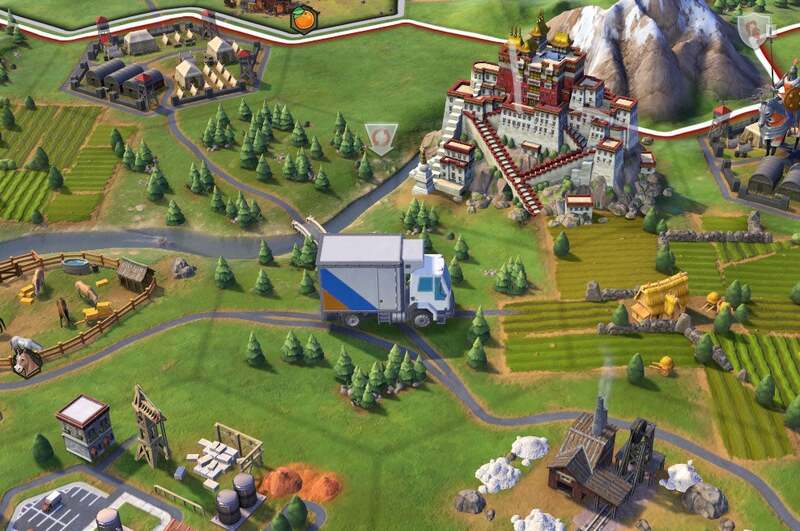 "There's a toy-like joy to Civ 5". 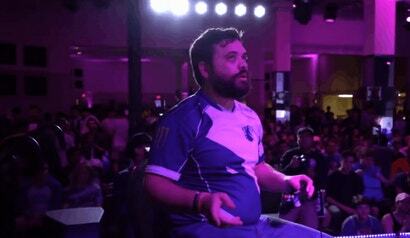 Just came on to let youse know that the knew Kotaku page design and layout is infinitely worse than the previous one. Cheers! the one more turn sensation isnt apeal. Its the urge and desire to get something done. This game is really really slow and drags on forever. any simple thing takes ages. People want to get to things done thats it. I feel this game is better than civ5 but it still have alot of problems. The tech trees are pretty bad, I dont feel like I care to go particular direction, either way works. you'd be fine to have it on full auto. I'm sure the game is great but I'm waiting until at least the first expansion. I know Civ V still has enough juice in it for me. I've never played a Civ game before but want to give it a go. Should I get this game or pick up Civ V Complete Edition?